Welcome to Aklavik: home of the barrenland grizzly. From its earliest days, Aklavik has been a multi-ethnic town, home to Inuvialuit, Metis, Gwich'in and non-aboriginal cultures. 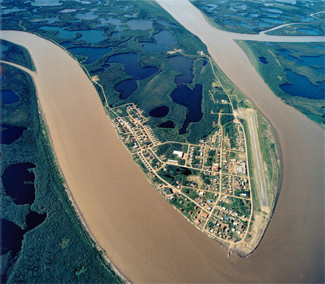 Situated on the west side of the Mackenzie Delta, approximately 1.6 degrees above the Arctic Circle, Aklavik was once considered the transportation, commercial and administrative capital of the western Arctic. The Mackenzie Delta is Canada's largest fresh water delta, a place rich in cultural and historical diversity. In close proximity to the Arctic Ocean and the beautiful Richardson Mountains, the hamlet of Aklavik is home to a wealth of extraordinary landscapes that reveal the astounding splendour of the Canadian north. If you are looking for an adventure in northern culture, remote wilderness and remarkable wildlife, Aklavik is your ideal destination.